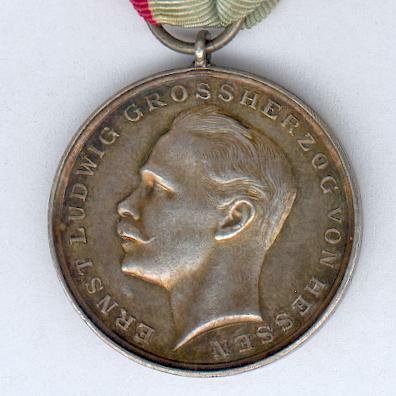 Circular silver medal with loop for ribbon suspension; the face with the head of Grand Duke Ernst Ludwig facing left, circumscribed ‘ERNST LUDWIG GROSSHERZOG VON HESSEN’; the reverse inscribed ‘FÜR TAPFERKEIT’ (for Bravery) within a circular wreath of oak and laurel; on possibly original ribbon cut short at the back. 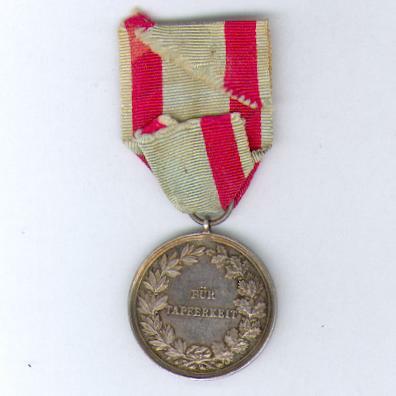 The Decoration was instituted in 1843 and bore the image of the successive Grand Dukes of Hesse. 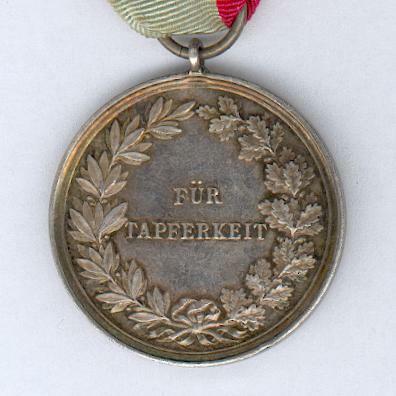 It was used as an award for a number of purposes, the inscription on the reverse varying accordingly, that inscribed ‘Für Tapferkeit’ coming to be known as the Hesse Bravery Medal (‘Hessische Tapferkeitsmedalle’). 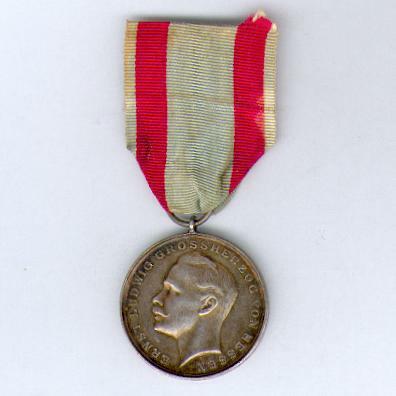 This example dates from the period between the accession and abdication of Grand Duke Ernst Ludwig (1894 to 1918) and was probably awarded in the early years of World War I (later examples being of ‘Kriegsmetall’ light alloy rather than silver).